A medical bed must be crafted for support and healing. 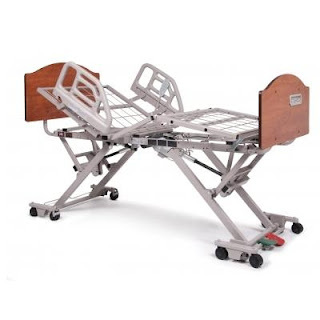 The Zenith Z9000APS Long-Term Care Bed will aid in rest and therapy and provides progressive speed and safety qualities. The bed and its features have been institutionally designed with both patient and caregiver in mind. It offers patient hand controls; the attendant controls are built into the footboard. Just add a mattress, and you've got a professional setup that will work for any long-term care situation in your home. The lounge chair and recliner style provides comfort and relaxation to the patient while also allowing closer positioning to the caregiver for proper care. Auto CPR functionality is ideal for CPR positioning in emergency situations. The cardiac chair is primarily designed for residents with heart and respiratory problems for whom a semi-erect position brings great relief. This “cardiac position” helps to elevate the patient from the waist up, which provides relief to the lungs, increases circulation and assists the patient in coming from a fully prone position to a sitting position without causing harm or undue strain. The height of the bed can quickly be changed, thus reducing caregiver back strain and the risk of staff occupational injuries. 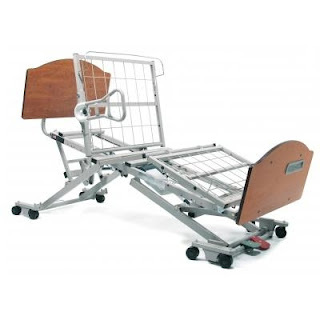 This long-term care bed adjusts from a low height of 7” to a high height of 30”. The bed is designed to operate silently, rise vertically to protect the walls during height travel and will remain level for proper therapeutic positioning. It has 360-degree mobility at any height. Attendant controls built into the floorboard and angled for better visibility. Intuitive two-pedal locking system, which is centrally positioned and easily visible from a distance to ensure that the bed is locked. Pedal locks are readily accessible at all bed heights and widths, even in the lowest position. The quick lockout buttons can lock multiple functions simultaneously. The bed rolls at any height, reducing caregiver back strain. A fully electric bed that is powered by ultra-whisper, rapid-moving DC motors. Battery backup in case of local power failure/outage. Grid support deck for superior strength. Tool-less assembly that minimizes setup. Bed can be put together in about 15 minutes. Warranties that include some of the longest in the industry. This premium bed will contribute to the patient’s comfort and therapy and is an ideal health aid for both homes and care facilities. Feel free to call PHC at 866-722-4581 for more information about the Zenith Z9000APS Long-Term Care Bed.